I am not so sure, however. This sixth “Star Trek” film has so much more life and interest than the dreary “Star Trek V: The Final Frontier” that perhaps it will tempt Paramount into still another story for Captain Kirk and his crew (perhaps a training voyage for the new generation?). 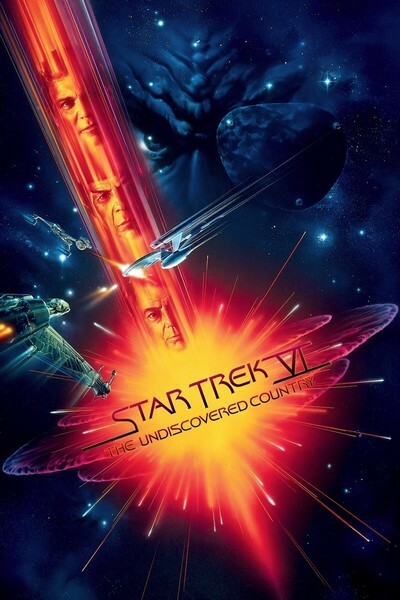 “Star Trek VI: The Undiscovered Country” begins, as so many “Star Trek” stories do, with a story set in the future but parallel to contemporary developments. In this case, as the Klingon empire begins to self-destruct after a Chernoble-type explosion on one of its moons, the obvious reference is to the disintegration of the Russian empire. There are a lot of lines like that in the script by Nicholas Meyer and Denny Martin Flinn, and a lot of lines by Shakespeare, too, who supplies not only the movie’s subtitle but also many references from “Hamlet” and elsewhere (“He is better in the original Klingon,” one of the enemy snorts.) At one point two of the supporting actors, the distinguished Shakespearians David Warner and Christopher Plummer, seem to be trading familiar quotations instead of dialog, but the strange thing is, it’s effective; in its pop-culture way, “Star Trek” has taken on a kind of epic quality over the years, and such references help establish the notion that the story really does take place in a future that remembers the past. If the dialog is from Shakespeare, the plot seems borrowed more from an old British country house mystery; one or more disloyal members of the Enterprise crew fire on a Klingon star cruiser and then port themselves on board to murder those who have come to ask for peace. Through plot complications that would have made Agatha Christie proud, the clues to the identify of the killers depend on bloody boots and bootprints, and figuring out who was where, and when. It doesn’t matter, because the movies aren’t really based on sets, or even much on action; they’re about ideas and relationships and here we see the old friendships of the Enterprise tested, and hear new versions of the same old jokes about how Vulcans don’t understand jokes. It’s entertaining, and reassuring. Why on earth (or anywhere else) would Paramount want to retire this crew, which is as familiar and comforting as old family friends, and which does its job with the effortless grace of long familiarity? In Shakespeare, the “undiscovered country” is death. And elsewhere trhe bard refers to one who dies as being like an actor who goes off to “study a long silence.” I don’t know if that will work here. I doubt frankly that the crew of the Enterprise can stop talking long enough to die.